Our septic system tends to freeze. This year alone I have had to thaw the septic line several times. 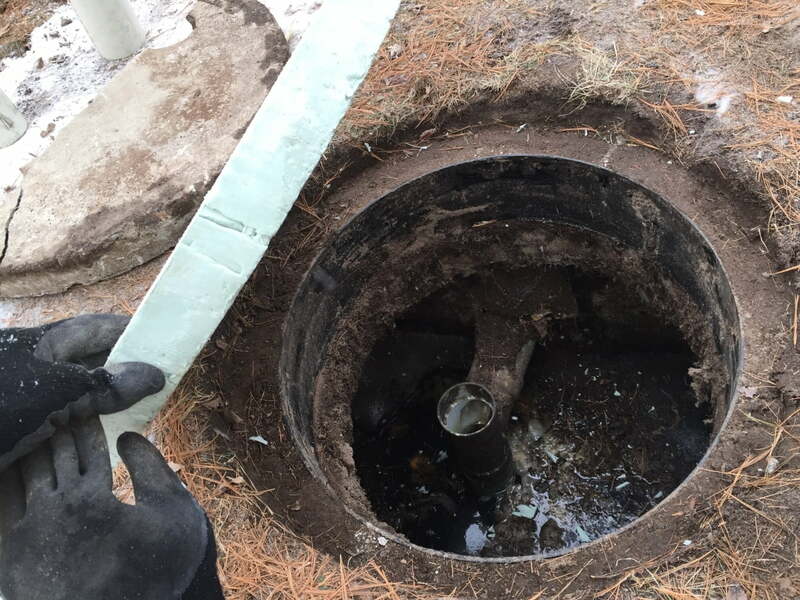 The problems with our septic system are common to frozen systems; long periods of no use, a shallow system with little natural or applied insulation, a low-flow continuous water source (high-efficiency furnace) and the bitter cold of central Minnesota. Over the years, I have been working on fixing a few of the core causes (the furnace, insulation, etc. ), but despite my efforts our system still freezes. I recently built and installed a custom high-capacity furnace condensate pump that will hopefully help. 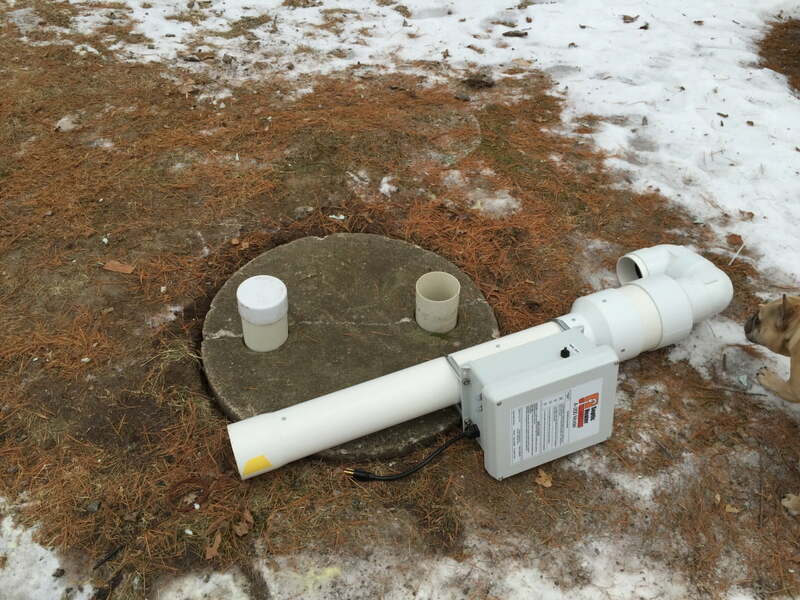 I have gotten fairly good at thawing the system – see my article on thawing a frozen septic line. But, it sure would be nice to spend a winter at the cabin without having to worry about the toilet backing up and the drains not working! 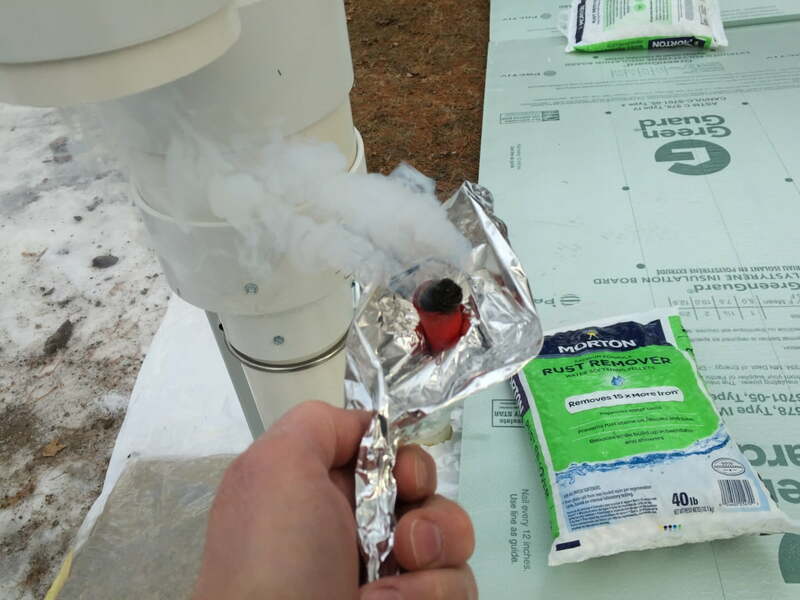 During my thawing of the frozen holding tank and septic line project, I decided to search for a possible cure for the repeating cycle of septic freeze ups. I was in the middle of adding rigid foam to the system when I figured there must be a way to add more heat to the system. I searched on the internet and found The Septic Heater Company. 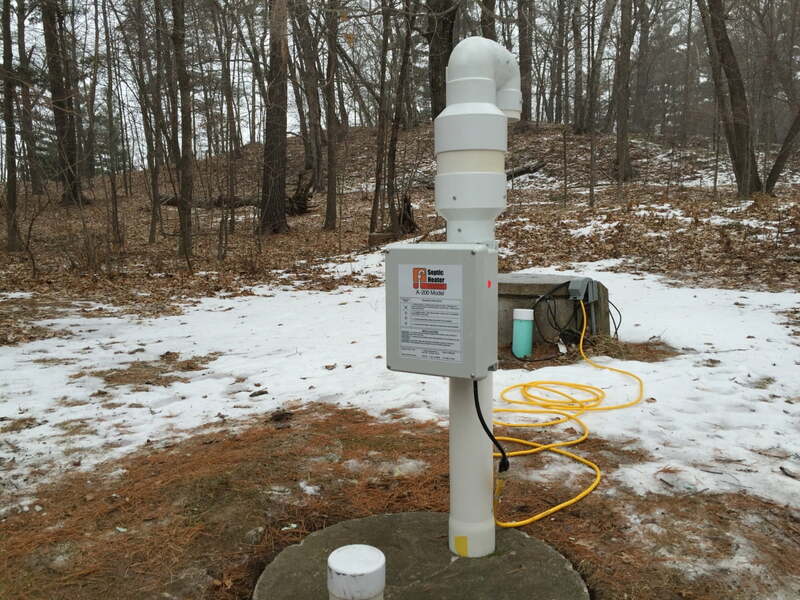 They have a product that blows warm air into your septic system to prevent freezing. It sounded great. It was also very expensive. I thought about it, and after a few phone calls, I had one delivered to my cabin (the manufacturer was located only 100 miles away from my cabin in Bemidji, Minnesota). 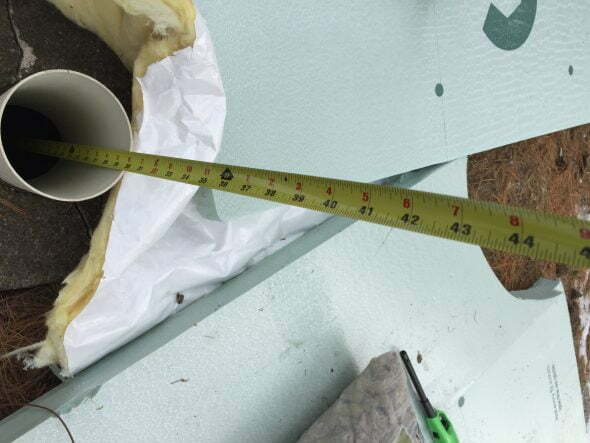 In addition to installing the Septic Heater, I added a round 2″ piece of foam board insulation under the concrete septic tank cover, and ground insulation above the system and line run back to the house. The system has been in place and on now for just a bit over a day, and it seems to be working beyond my expectations – my frozen solid holding tank is now nearly thawed. I will need to wait a few weeks before declaring victory, but it looks good so far! Mount heater on 4″ inspection pipe. Run extension cord to unit. Set up and start unit. Insulate over tank and line runs. 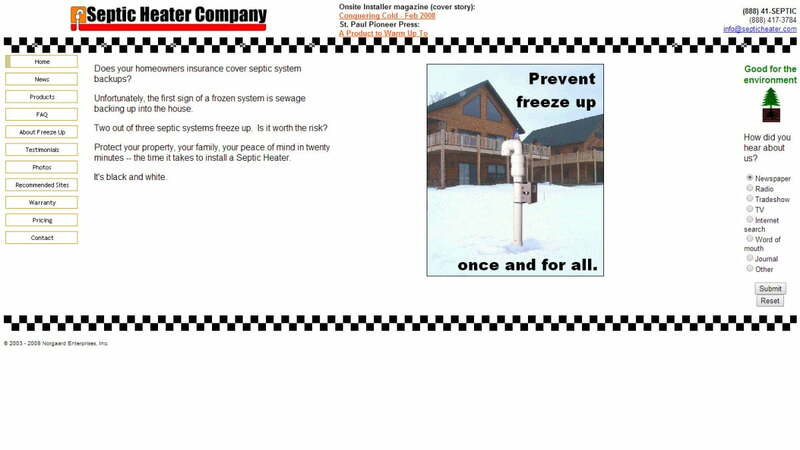 Order The A200 Septic Heater From The Septic Heater Company. Order a the Septic Heater Model A200 (the only model the company currently sells) from The Septic Heater Company online at their website or by calling 1-888-417-3784. The unit is shipped well packaged in a sturdy cardboard box with foam inserts. Unpack the unit and remove packaging tape from unit. A200 Septic Heater unpacked and ready for install. Notice cover removed from inspection pipe for install. Measure And Set Depth Of Thermostat Sensor. The A200 has both a manual and an automatic operational mode. The automatic mode is thermostatically controlled to keep the temperature of the sensor above 38 degrees Fahrenheit. Before mounting the unit over the chosen inspection pipe, set the proper length for the thermostat sensor. The sensor is taped inside the bottom of the unit’s base (yellow tape, as seen in above image). 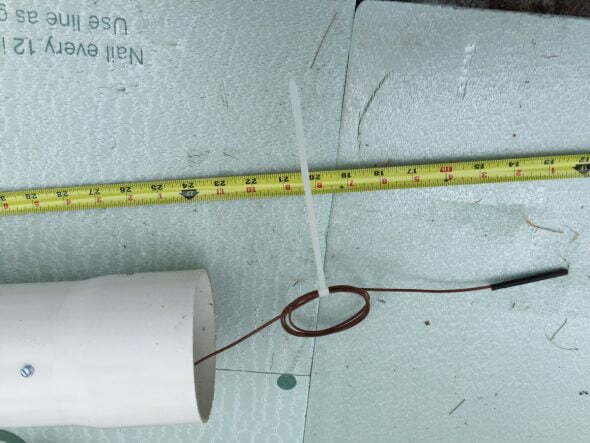 Unroll the sensor and after determining the proper hang distance, secure excess sensor wire with a cable tie. To set the proper length, first measure the approximate distance from the liquid level in the tank to the to the top of the mounting surface for the unit. Subtract 4″ from this distance, and use this distance for the length of the sensor wire. 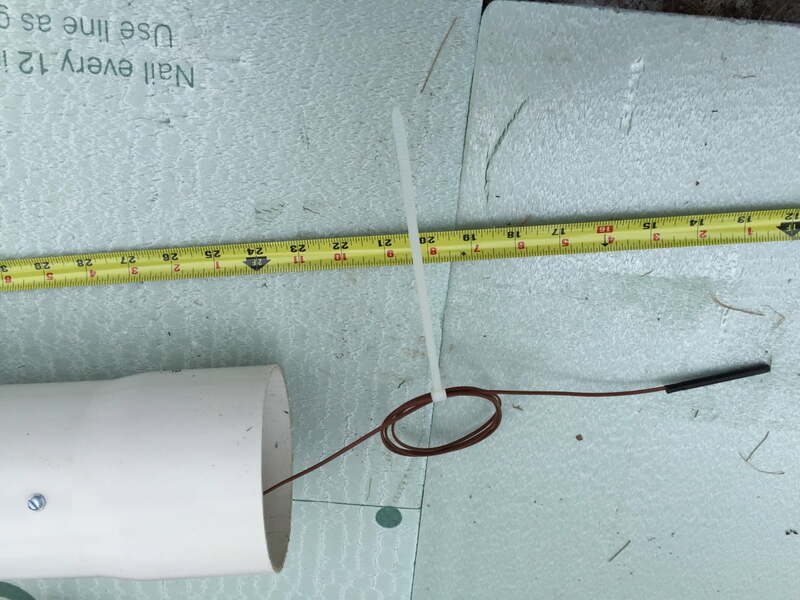 Measure distance from tank lid to tank liquid level (~ 24″ for mine tank). Subtract 4″ or so from this distance and set sensor to this length (~ 20″ for mine). Set the hang of the sensor and roll up the excess sensor wire. Secure the wire with a cable tie. 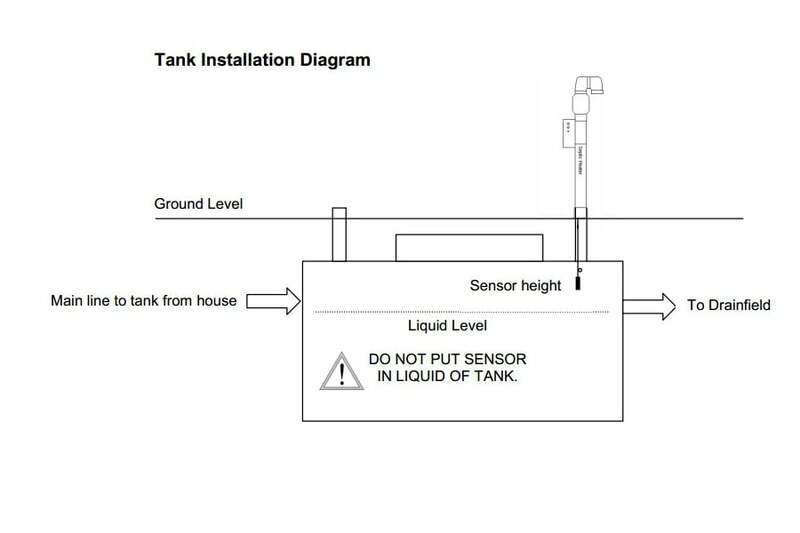 Set depth of sensor to keep sensor just above liquid in tank. Trim the cable tie once tight. Install Heater Over 4″ Inspection Pipe Stub. The A200 unit has a base made to fit over a standard 4″ DWV (thin wall) PVC pipe. Most inspection caps use this 4″ pipe. If your system uses a different size or type of pipe, you will need to use an appropriate adapter to mount the heater. When ready, guide the sensor into the inspection pipe and mount the unit. The unit should slide over the existing pipe and settle at the base of the pipe. There are no screws or other hardware needed to mount the unit. Pass sensor into tank and mount unit over 4″ inspection pipe. I have to admit, I was initially a bit skeptical about the stability of the modestly heavy unit just sitting over the 4″ pipe stub. But, after several weeks of use in rather windy conditions, the unit seems stable. You certainly could add some stabilizing brace or a few sand or salt bags at the base for stability if needed. Connect Unit To Power And Start Unit. Once mounted, connect the power source to the unit. Use only an appropriately sized 15 amp or more rated extension cord designed for outdoor use. Typically this means a 12 gauge heavy duty extension cord, depending on the length needed. Use a power outlet that will limit the run of your extension cord and avoid passing through areas of foot or other traffic. Connect unit to heavy-duty extension cord. Many septic systems will have an appropriate outdoor outlet for the lift pump if your system is so equipped. This may be a good power source for your unit, depending on the outlet size and current needs of your lift pump. Once your unit is connected to the power, turn on the unit using the switch on the right-hand side of the unit. Turn the unit on Manual Mode. You should hear the unit’s fan turn on and feel a slight vacuum under the intake of the unit. The red light on the side of the unit should glow steady red with the unit on Manual Mode. 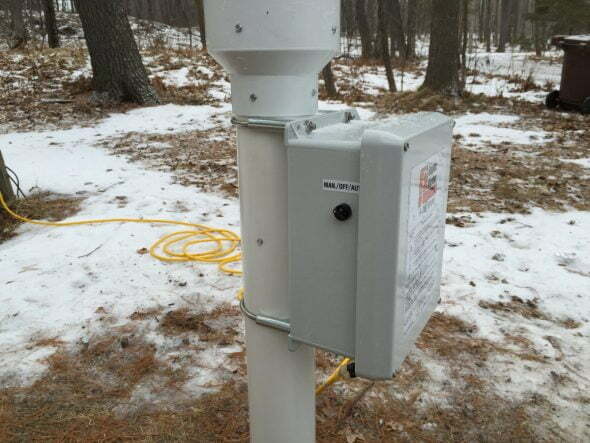 Smoke Test Unit / Septic System. Test that the unit is pushing warm air through your septic and and drain plumbing using the smoke bomb included with the A200 Unit. The unit operates by pushing warm air into the septic system and back into your home waste plumbing. This warm air flow is then directed up through your drain plumbing vents that exit your home through your roof. Smoke test checks patency of septic lines, waste and soil lines and drain vent circuits. The water traps installed in your drain plumbing prevents the flow of this warm air back into your home and directs it up, through your drain venting, out of your home. 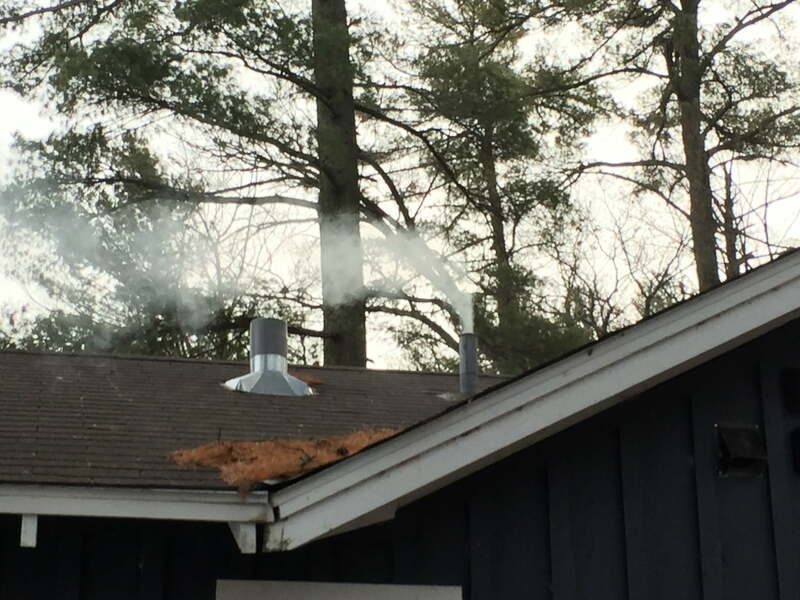 The smoke test will confirm that the warm air is moving properly through your waste and drain plumbing and is safely discharged through your roof via your drain vent circuits. Smoke test system using provided smoke bomb. Light device with ligther or torch and hold in heat resistant container (I used a tin foil tray). The test is important. If smoke is not seen exiting your roof drain vent circuits, you may have blockage (frozen or otherwise) within your septic system or waste line that will need to be opened prior to using the A200 unit. Smoke should exit through roof vented drain vent circuits and not enter living area of home. In addition, no smoke should enter your living space within the home. If the smoke does enter your living space, this likely means that you have a malfunctioning drain water trap (usually the trap has simply dried out and needs to be filled with water). Find the drain that is allowing the heater air (the smoke) of the home and pour water down the drain to fill the trap and seal the drain circuit. Drain water traps work by holding a reservoir of water “trapped” in a u-shaped depression of the drain to prevent sewer gasses from moving backward into your home. In the same fashion, functional drain traps will prevent the warmed air (warm sewer air) from entering your home while the unit is in use. Understanding the importance of functional drain traps related to the use of the A200 Septic Heater, you should add water to every drain that has a trap (they all should) to “refresh” the water level and prevent the A200 unit from blowing warm sewer air into your home. Consider the possibility of water traps drying out if your will be away for very long periods of time. I have used the unit for several weeks while away and have not yet experienced trouble with drain traps drying out. I suspect this would be more of a problem if the unit were used continuously on manual mode. Manual mode runs continuously at 140 degrees. Automatic mode, in comparison, runs intermittently to keep the air temperature at or above 38 degrees. I would suspect running in manual mode could dry out water traps more quickly than the running the unit in automatic mode. 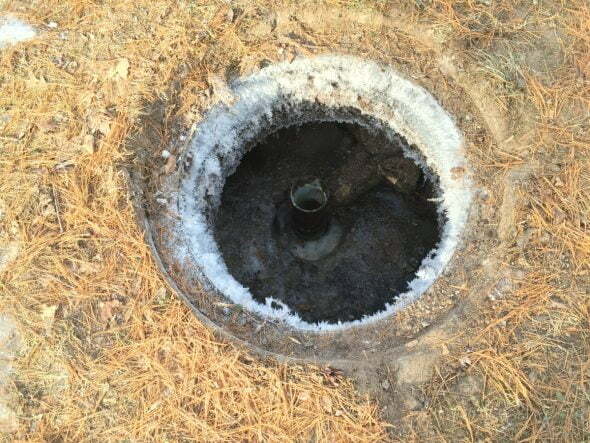 Bottom line; make sure your water traps are functional and full. Laundry, in-frequently used bathroom and other low-use water traps should be filled with water periodically in any home, but especially before using this unit. After installing the unit, consider adding insulation over the access lid of your septic system and the ground of problematic parts of the system. Septic line runs, holding tanks, drain fields, etc. all will benefit from adding insulation to help keep heat within the system parts. 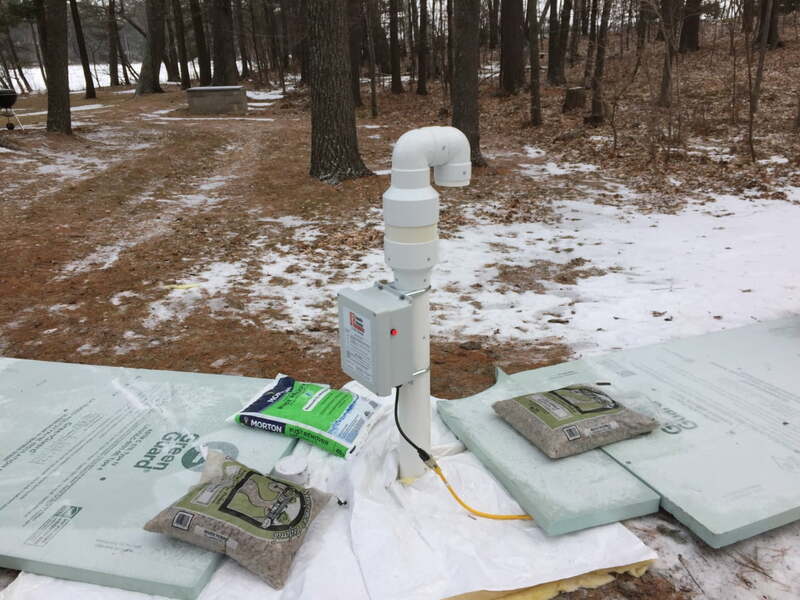 I added 2″ rigid foam board insulation over the septic line runs and under the cover of the septic tank where I installed the A200 heater. 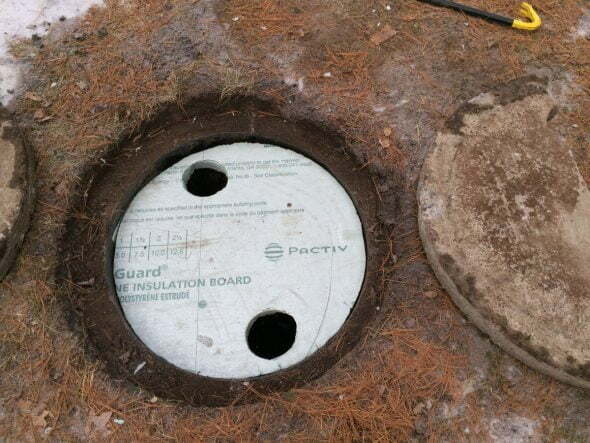 Plastic backed fiberglass insulation jacket (hot water heater insulation) spread over septic tank cover. 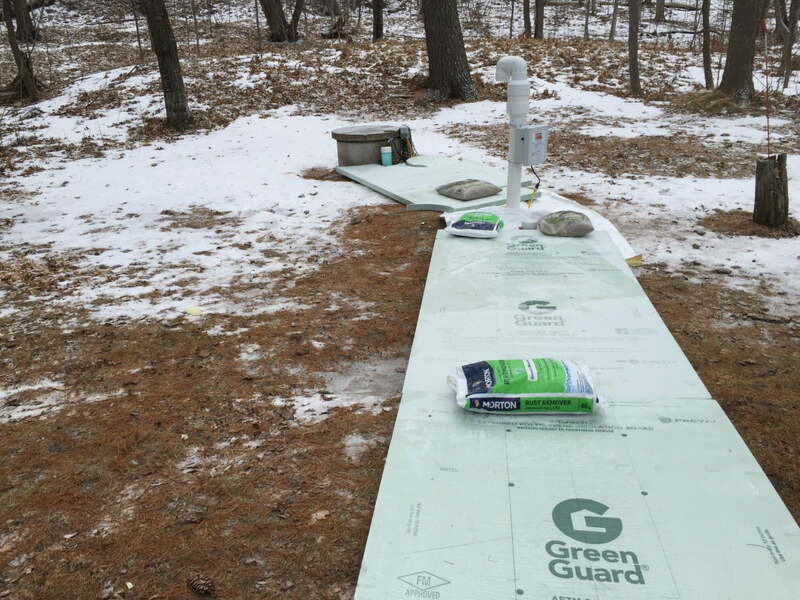 Rigid foam board installed over ground above septic lines and holding tank. Water softener salt bags used to hold insulation in place. You can use a variety of insulators. Many use straw or hay, mulch, thermal heating blankets, or similar. Any insulation you add will help the unit keep the system consistently warm and reduce the cycling of the unit and electricity use. To use your system, switch the system off. Then unplug the system for 60 seconds. Then replug the system and turn the system on “Automatic”. The automatic mode will cycle periodically to keep the system at or above 38°. I suggest power cycling the unit before switching to the automatic mode from the manual mode (used initially for smoke testing) as the power cycle will clear the unit’s memory. This maneuver seems to prevent errors that I encountered when switching the unit from manual to automatic without power cycling the A200. While you will use the unit in the automatic mode most of the time, I have found the manual mode very useful in clearing ice within the holding and lift tanks. 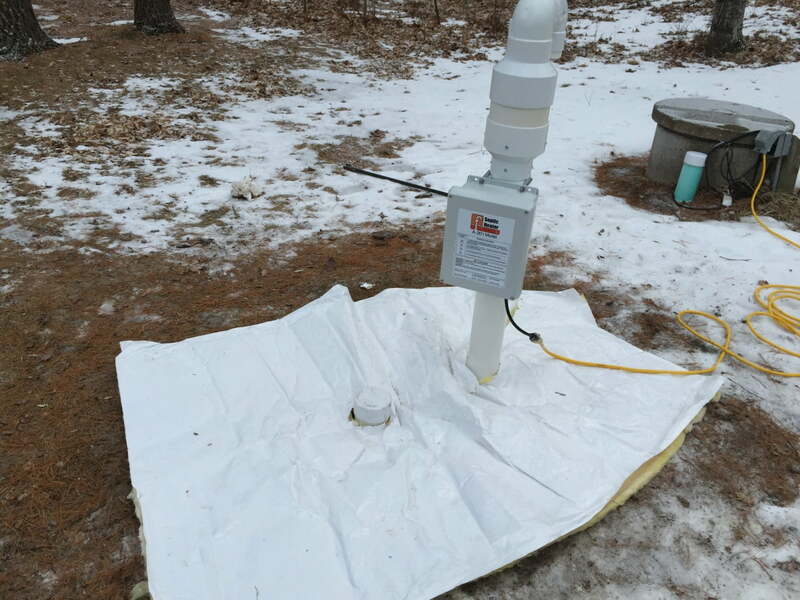 The unit is not designed specifically to thaw frozen septic lines or tanks, but obviously a continuous stream of 140° warm air blown into a frozen septic system will help. In fact, when I initially installed the unit my holding tank was frozen solid. I set the unit up, insulated over it and ran it for a day and a half in manual mode. After this, the holding tank was mostly thawed! Septic tank content largely thawed after running unit in manual mode for 36 hours. After this initial use, I ran the unit for the next two weeks while I was away from the cabin, in automatic mode. When I returned, the septic was working properly and had not frozen while I was away (like it did twice in the weeks before I installed the unit). But, I did notice the water level in my lift tank was high (the lift tank level alarm went off). I pushed back the cover for the lift tank and could see that the contents were frozen. I tried manually operating the lift pump, and I could hear it running but it was unable to empty the mostly frozen contents. Knowing the holding tank (where I have the A200 unit mounted) is directly connected to the lift tank, I figured I could thaw the full and iced lift tank by running the A200 again in manual mode. I did so, running the A200 in manual mode overnight and the next day the lift tank was mostly thawed. I was then able to run my lift pump manually (by plugging in the pump directly to the outlet and removing the piggyback connection) and pump out nearly all of the trapped water in the lift tank! Sweet! So, the A200 works well when run in the automatic mode. But it is also a very powerful tool in the manual mode. The primary area under the A200 will stay frost free. Depending on your problem area, you should mount your unit above this area if possible. 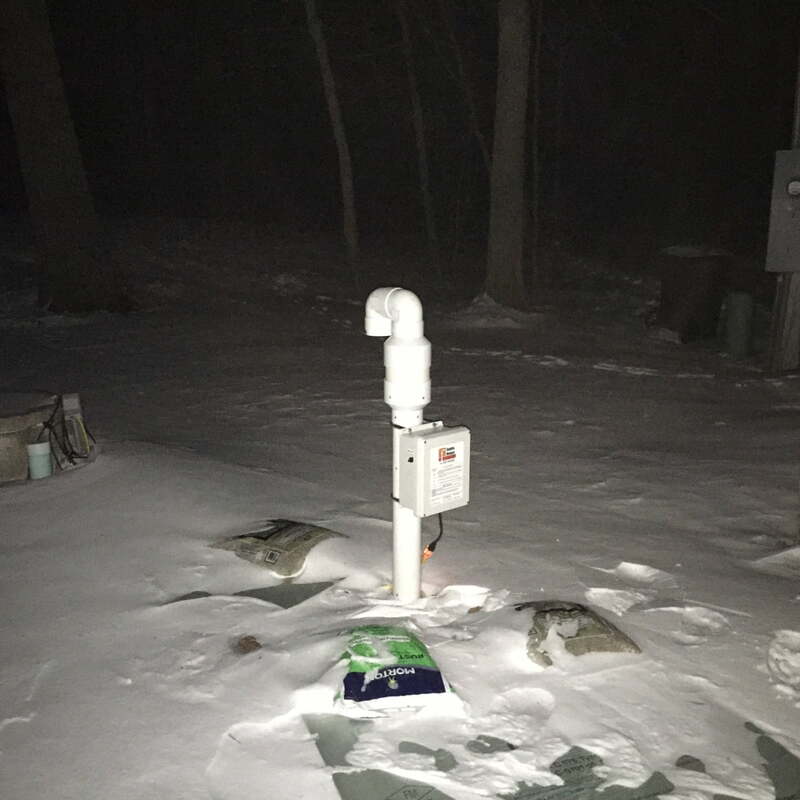 More distant regions of your septic system may still ice up (as did my lift tank), but you can then run your A200 in manual mode as needed to add more heat to the system and thaw frozen areas. The A200 Septic Heater quietly doing its thing! Best wishes with your system. There is nothing better than a worry free winter septic system. So far, it looks as though the A200 is the answer for my often frozen septic. The units are expensive, but for me worth it. 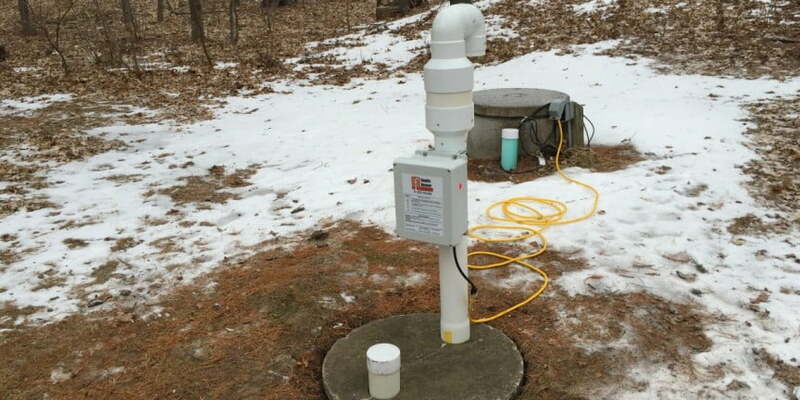 I strongly recommend considering one of these units if you have had problems with your winter septic system. Free free to contact The Septic Heater Company with any questions. The owner, Chris Norgaard will likely answer the phone himself and is very helpful. Measure distance from tank lid to tank liquid level (30" for mine tank). Subtract 4" from this distance and set sensor to this length (26" for mine). 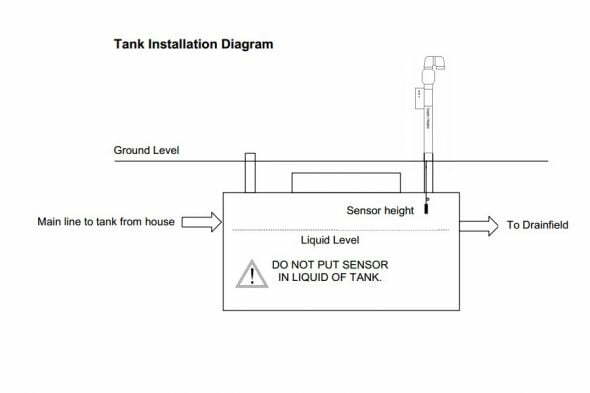 Set depth of sensor to keep sensor just above liquid in tank. Pass sensor into tank and mount unit over 4" inspection pipe. I don’t understand where you have instaled this nearly $2,000 unit on your septic. Just after my septic leaves the house there is a a 4 inch (or 3 inch) vertical pipe right next to the house that goes outside. The septic pipe cntinues underground 10 feet to dump horizontally with a slight drop into the first septic holding tank (the second is a gray water tank). So the only pipe that would fit vertically is where the pipe immediately comes out of the house. Is that the pipe you mean? I installed the heating unit just above my holding tank (the first tank). This tank on my system has to vertical 4″ inspection pipes and the heater mounts on one of these. It sounds like your system does not have inspection pipes and the pipe that you mention sounds like a clean out — a short capped vertical piece of pipe that would allow you access to the septic line to clear a blockage or similar. The proper installation of the heater depends on where the location of the freeze-ups are occurring in your system. The heater will blow warm air into the system to help prevent freezing, so the heater should be located such that the path of the warm air, from the heater to the home, will move through your problem area in the system and prevent future freeze ups. We have the same set up, clean out pipe next to the house, also pipe is more shallow as It elevates from the tank to the house. I bought a piece of 12″ diameter PVC that was 4″ taller than the cleanout pipe. 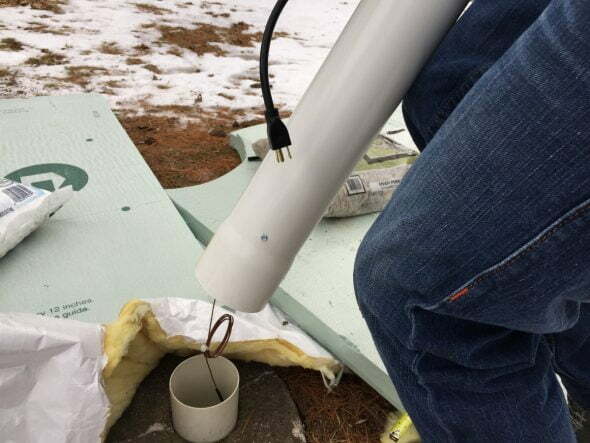 I slid it over the pipe, stuffed the inside space with fiber insulation, then cut a piece of 2″ foam insulation the size of the opening in the top of the PVC sleeve. Punched a hole in the center to run a piece of rope through with a knot on each end and pushed in on the tope opening. The piece of rope allows me go pull off the foam cover when necessary, I also filled 2 trash bags loosely with leaves, and laid them around the base of the pipe. Did this last year, This year I cut a hole in a 2″ foam insulation sheet and slid it over the pipe so a larger area near the house would be aided by this extra insulation. We were plagued for years with a frozen pipe, Septic heater A2000 and this extra protection near the house has so far prevented any problems with frozen pipes. We love this solution. Hello. I just came across your website during a search for septic heaters. Very nice and detailed article. You gave me a lot to think about. We have a newly built cabin in MN. It was finished fall of 2014. Went away for five weeks last winter and came back to a frozen septic drain line, just as you describe. Same furnace issue. Like the other reply, I was really amazed that neither the plumber or heating guy ever mentioned this as something that needs to be considered. My remedy (hopefully) this year is a 120 foot “roof” heater cord that I fished through the 50 feet of 4″ PVC septic pipe running from the house to the main septic tank. I have the heat cord doubled up in the pipe. I have not used it yet, but plan to put it on a timer if we go away for more than a week or so. This option was suggested by the sewer guy I paid $170 to for five minutes work opening up our frozen line last March. Regardless, I like your idea and will consider it more if this idea doesn’t work. Thanks for the website and the interesting information. You should also check out my article on a better condensate pump. 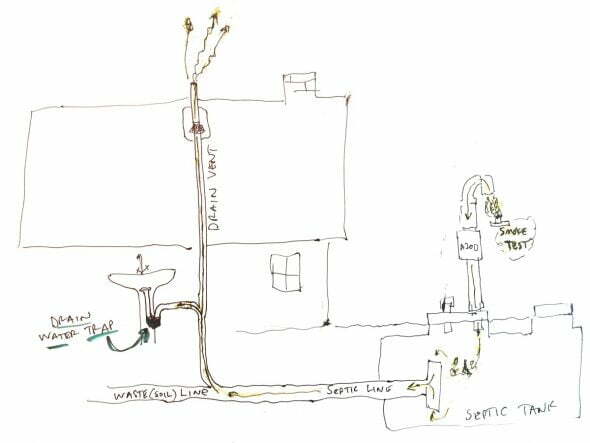 People do use heating lines as you suggest, but I would be concerned about possible plugging of the septic line from debris getting hung up on the wire. One of the guys that thawed our systems a few years back also recommended the same heat line, so it must work. Last year in MN was tough, my system froze multiple times before I added the fixes. Thanks for the reply. That was actually the article I thought I was commenting on…the condensate pump. Anyway, yes I’m also concerned about stuff getting hung up on the cords, but I put it in only a month ago and plan to pull it out in the spring. Regardless, I prefer some fix like you describe. I think there are some other advantages to a larger volume of water at one time going into the system, rather than the small flow from the furnace. One other note is that along with the frozen drain pipe, we also did have ice in our second tank with the lift pump. That finally thawed on its own when we started putting water in the system. This year we also did the piles of leaves and tarp thing for insulation. Maybe will send along a report in the spring as to how things go this year. Thanks again! HI CHRIS, GLAD TO SEE YOU’RE STILL IN BUSINESS. I HAVE AN OLD AUTOMATIC MODEL OF YOUR A-200 WHICH I’VE USED FOR SEVERAL YEARS NOW WITH COMPLETE SUCCESS, HOWEVER, OCCASIONALLY I BELIEVE SOMETIMES WHEN THE HEATER KICKS IN IT TRIPS THE CIRCUIT BREAKER? THE BREAKER IS 20AMPS AS YOU RECOMMEND.PLEASE COMMENT. I NOTICE THAT YOU ALSO, SAY YOU CAN USE THE HEATER TO THAW THE TANK? MY DIRECTIONS SAY YOU CAN’T? WHAT’S THE STORY HERE? Yes, the Septic Heater Company is still in business. Their website is SepticHeater.com. This website is a do-it-yourself website for cabin projects. This article is a demonstration of installing and using the Septic Heater A200 at my cabin in Minnesota. Regarding the circuit breaker issue, it must be one of two issues; (1) Your breaker is faulty and tripping at a load of fewer than 20 amps or (2) your system is drawing more than 20 amps. Obviously, that leaves many possible issues. I would ensure that the extension cord you are using is of sufficient rating to handle 20 amps (typically 14 gauge wire cord in good condition) and that your connections are clean and remain dry during use. The circuit should be GFI protected as well. Regarding thawing your septic tank with the A200, I have successfully done so. It is true that the user manual does state the A200 is not intended to thaw a frozen system, but the heat generated by the unit when used in the continuous mode was sufficient to thaw my system and may be useful in doing so for others with similar systems. For more info, contact the Septic Heater Company at the above-referenced website. Thanks Norm and good luck with your sale!